Free speech has its obligations FOX! Belinda Wade on Is she Britney Spears? Oh, that's quite cool. It's nice to add a bit of aesthetic flair into function, no? 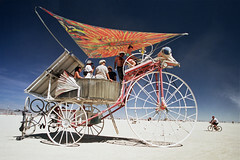 Art cars are eye-catching, but it's the cherry on the sundae when it comes to the idea of solar powered vehicles.